The competitive fire that burns inside Weston Rutkowski has only been stirred. This week he moved into the No. 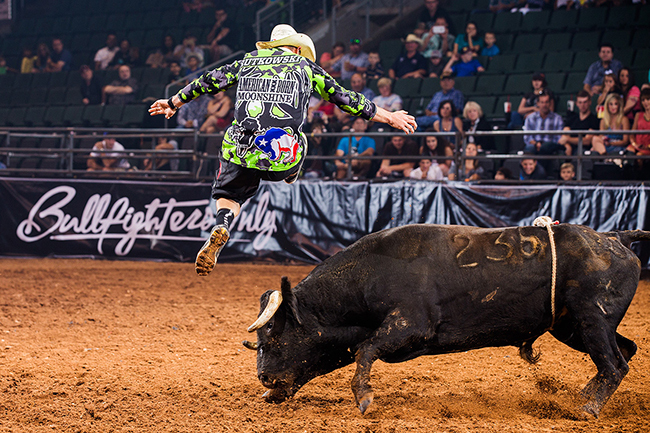 1 spot in the Bullfighters Only tour standings, having earned $17,625 so far this season. But he’s not content. Freestyle bullfighting is exactly that. It’s man vs. beast, with scores based on a 100-point scale, men can earn up to 50 points per fight based on their ability to exhibit control and style while maneuvering around or over an animal; a bull can earn up to 50 points based on its quickness, aggression and willingness to stay with the bullfighter. Rutkowski finished runner-up in a four-night Bullfighters Only event this past week in conjunction with California Rodeo Salinas, and those earnings shot him past season leader Nathan Jestes of Douglas, Wyo., by $550. He also finished in at least a tie for second in Arlington, Texas; Phoenix; Cedar Park, Texas; and Cody, Wyo. He has been in the winner’s circle, earning a key victory at the BFO that was part of the Reno (Nev.) Rodeo. He also posted the highest-marked fight last week in Salinas, an 88.5 to win the second go-round. Of course, natural ability helps considerably, and that’s what fans see during a Bullfighters Only event; it features the top 15 bullfighters in the sport. More than anything, though, the men who are part of Bullfighters Only put in considerable work to maintain their status. “It’s as much physical as it is mental,” Rutkowski said. “You’re not showing up at rodeos just reading the bulls and reacting; sometimes you have to take that fight to the animal. It’s vital in a sport where the opponent is much bigger, stronger and faster to have the right attitude and the right talent. Fans see it, and so do the rodeos with which Bullfighters Only has associated itself. Rutkowski won’t rest too much on being the No. 1 man on tour. He will be back in action next week during the Bullfighters Only event at the Dodge City (Kan.) Roundup Rodeo, then will return to the competition stage for the BFO event in conjunction with the Sikeston (Mo.) Jaycee Boothill Rodeo on Aug. 10-11.